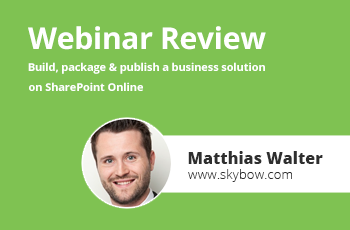 Build, package & publish a business solution on SharePoint Online - skybow Webinar. Every software solution goes through well-known, long-established lifecycle stages. Of course, this is also the case with the business solutions built on top of SharePoint. Each solution must be deployable on multiple environments. It must be possible to apply updates caused by requirement changes easily to one or more environments. On the end, it should be possible to retract the solution from the environment without leaving proprietary stuff behind. skybow Solution Studio Online adds unique and yet standardized capabilities to this process. SharePoint data structures, solutions and customizations are easy to package and deploy to any target site, regardless if they are in the same or different environment. Solution versioning and updating process is standardized, and different deployments are easily managed and tracked through solution dashboards. Is it possible to configure and use webservice calls? Yes, this is possible using the skybow Actions. There we provide an action type "HTTP Request". The following figure is an example of how to kick off an Microsoft Flow. We can pass any data from SharePoint using our Expression Language like shown in the data section "Title": "[[Title]]" where [[Title]] is a placeholder using the internal fieldname. This makes it very powerful!